Rhododendron is the common and genus name for a large and diverse group of woody shrubs and small (rarely large) trees in the flowering plant family Ericaceae. It is a large genus with over 1000 species, and subdivided into various subgenera (commonly eight, nine, or five, depending on the taxonomic scheme). The trees may be deciduous or evergreen and the spirally arranged leaves can vary significantly in size according to species, from one to two centimeters (0.4-0.8 inches) up to 100 centimeters (39 inches). Members of two of the traditional subgenera, Pentanthera (deciduous), and Titsushi (evergreen), are known as azaleas. Rhododendrons, including azaleas, generally have showy flower displays. Indeed, the name rhododendron comes from the Greek rhodos, meaning "rose," and dendron, meaning "tree." As such, and combined with their often being evergreen, they often are cultivated as ornamental plants, such as around the foundations of houses or in woodland gardens, and even as specimen plants. They also provide important ecological values. They provide food for a number of insects and an important source of pollen and nectar for many bumblebees, who in turn pollinate the plants. However, rhododendrons also are poisonous to many grazing animals, such as horses. Some species (e.g. Rhododendron ponticum in the United Kingdom) are invasive as introduced plants, spreading in woodland areas replacing the natural understory. R. ponticum is difficult to eradicate, as its roots can make new shoots. Ericaceae, the family to which the genus Rhododendron belongs, is known as the "heath family," and consists of herbs, shrubs, and trees with leaves that are alternate, simple, and estipulate, and mostly lime-hating or calcifuge plants that thrive in acid soils. In addition to rhododendrons, well-known examples include cranberry, blueberry, heath, heather, and huckleberry. The Rhododendron genus is characterized by shrubs and small to (rarely) large trees, the smallest species growing to ten to 100 centimeters (3.9-39 inches) tall, and the largest, R. giganteum, reported to over 30 meters (98 feet) tall (Francis 2006). The leaves are spirally arranged; leaf size can range from one to two centimeters (0.4-0.8 inches) to over 50 centimeters (20 inches), exceptionally 100 centimeters (39.4 inches) in R. sinogrande. They may be either evergreen or deciduous. In some species the underside of the leaves is covered with scales (lepidote) or hairs (indumentum). Some of the best known species of rhododendrons are noted for their many clusters of large flowers. There are alpine species with small flowers and small leaves, and tropical species such as section Vireya that often grow as epiphytes. Some rhododendrons are known by the common name of azalea. These are flowering shrubs that are characterized by the lack of scales on the underside of the generally thin, soft, and pointed leaves, and typically having terminal blooms (one flower per stem), flowers with five or six stamens, and with long straight hairs parallel to the leaf surface and along the midrid on the ventral surface of the leaf. Originally, azaleas were classed as a different genus of plant, but now they are recognized as part of the rhododendrons. In the common classification of rhododendrons into eight or nine subgenera, azaleas comprise two of the subgenera: Pentanthera (deciduous) and Titsushi (evergreen). Rhododendron is a very widely distributed genus, occurring throughout most of the Northern Hemisphere except for dry areas, and extending into the Southern Hemisphere in southeastern Asia and northern Australasia. The highest species diversity is found in the Himalayan mountains from Uttarakhand, Nepal, and Sikkim to Yunnan and Sichuan, with other significant areas of diversity in the mountains of Indo-China, Korea, Japan, and Taiwan. Rhododendron, also known as "Lali Guras" in local language, is the national flower of Nepal and the state tree of the state of Uttarakhand in India. In Korea, Rhododendron schlippenbachii is particularly common (called 철쭉 (choltjuk)). In addition, there are a significant number of tropical rhododendron species from southeast Asia to northern Australia, with 55 known species in Borneo and 164 in New Guinea (Argent 2006). Relatively fewer species occur in North America and Europe. Rhododendrons have not been found in South America or Africa. The genus Rhododendron was created by Linnaeus in 1753, but he placed the azaleas in another genus. However, it was later recognized that a separation between azaleas and the members of Rhododendron could not be justified and they were placed together. The Rhododendron genus was subdivided into eight sections in 1834 by George Don and these eight subcategories have been commonly recognized until today, with the azaleas comprising two of the sections, subgenus Pentanthera (typified by Rhododendron nudiflorum) and subgenus Tsutsusi (typified by R. Tsutsusi) (Henning 2007). However, other subcategories also have been recognized. 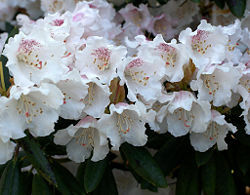 It is not uncommon for nine subgenera to be recognized, with section Vireya within the large subgenera Rhododendron being raised to the subgenus level (Callard 2008). Furthermore, in 2004, based on genetic and chemical data, Goetsch et al. (2005) called for a new realignment in which the genus Rhododendron was subdivided into five subgenera (Rhododendron, Hymenanthes, Azaleastrum, Choniastrum and Therorhodion). Essentially, they call for the elimination of three subgenera and two sections that are present in the taxonomic system of Chamberlain et al. (1996) and the inclusiong of inclusion of section Pentanthera within subgenus Hymenanthes. Subgenus Rhododendron L.: small leaf or lepidotes (with scales on the underside of their leaves); several hundred species, type: Rhododendron ferrugineum. The tropical rhododendrons (sect. Vireya, about 300 species) are usually included as a section in this subgenus, but sometimes split off as a ninth subgenus. Subgenus Hymenanthes (Blume) K.Koch: large leaf or elepidotes (without scales on the underside of their leaves); about 140 species, type: Rhododendron degronianum. Subgenus Pentanthera G.Don: deciduous azaleas; about 25 species, type Rhododendron luteum. Subgenus Tsutsusi: evergreen azaleas, about 15 species; type Rhododendron indicum. Subgenus Azaleastrum Planch. : five species; type Rhododendron ovatum. Subgenus Candidastrum (Sleumer) Philipson & Philipson: one species; Rhododendron albiflorum. Subgenus Mumeazalea: one species, Rhododendron semibarbatum. Subgenus Therorhodion: one species, Rhododendron camtschaticum. Recent genetic investigations have caused an ongoing realignment of species and groups within the genus, and also have caused the old genus Ledum to be reclassified within subgenus Rhododendron. As noted, further realignment within subgenera is currently proposed by Goetsch et al. (2005). 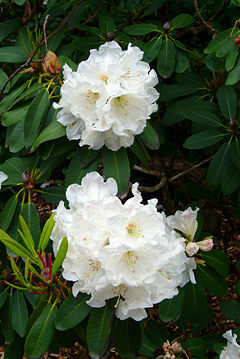 Rhododendrons are extensively hybridized in cultivation, and natural hybrids often occur in areas where species ranges overlap. There are over 28,000 cultivars of rhododendron in the International Rhododendron Registry held by the Royal Horticultural Society. Most have been bred for their flowers, but a few are of garden interest because of ornamental leaves and some for ornamental bark or stems. Some rhododendron species, including azaleas, are poisonous to grazing animals. These rhododendrons have a toxin called grayanotoxin in their pollen and nectar. People have been known to become ill from eating honey made by bees feeding on rhododendron and azalea flowers. Xenophon described the odd behavior of Greek soldiers after having consumed honey in a village surrounded by rhododendrons. Later, it was recognized that honey resulting from these plants have a slightly hallucinogenic and laxative effect. The suspect rhododendrons are Rhododendron ponticum and Rhododendron luteum (formerly Azalea pontica), both found in northern Asia Minor. Eleven similar cases have been documented in Istanbul, Turkey during the 1980s (Sütlüpmar et al. 1993). 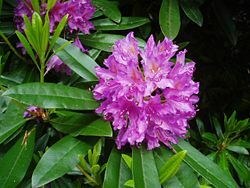 Rhododendron is extremely toxic to horses, with some animals dying within a few hours of ingesting the plant, although most horses tend to avoid it if they have access to good forage. Both species and hybrid rhododendrons, including azaleas, are used extensively as ornamental plants in landscaping in many parts of the world, and many species and cultivars are grown commercially for the nursery trade. Rhododendrons are often valued in landscaping for their structure, size, flowers, and the fact that many of them are evergreen (Huxley 1992). Azaleas are frequently used around foundations and occasionally as hedges, and many larger-leafed rhododendrons lend themselves well to more informal plantings and woodland gardens, or as specimen plants. In some areas, larger rhododendrons can be pruned to encourage more tree-like form, with some species such as R. arboreum and R. falconeri eventually growing to ten to 15 meters (33-49 feet) or more tall (Huxley 1992). Rhododendrons are grown commercially in many areas for sale, and are occasionally collected in the wild, a practice now rare in most areas. Larger commercial growers often ship long distances; in the United States most of them are located on the west coast (Oregon, Washington, and California). Large-scale commercial growing often selects for different characteristics than hobbyist growers might, such as resistance to root rot when over-watered, ability to be forced into budding early, ease of rooting or other propagation, and saleability (Cox 1993). Like other ericaceous plants, most rhododendrons prefer acid soils with a pH of roughly 4.5 to 5.5. Rhododendrons have fibrous roots and prefer well-drained soils high in organic material. In areas with poorly-drained or alkaline soils, rhododendrons are often grown in raised beds using mediums such as composted pine bark. Mulching and careful watering are important, especially before the plant is established. Some tropical Vireyas and a few other rhododendron species grow as epiphytes and require a planting mix similar to orchids. There are a number of insects that either target rhododendrons or will opportunistically attack them. Rhododendron borers and various weevils are major pests of rhododendrons, and many caterpillars will attack rhododendrons. Major diseases include Phytophthora root rot, stem and twig fungal dieback. Rhododendron species are used as food plants by the larvae of some members of the Order Lepidoptera (butterflies and moths). Argent, G. 2006. Rhododendrons of subgenus Vireya. Royal Horticultural Society. ISBN 1902896610. Callard, C. 2008. The classification of vireya rhododendrons Vireya. Retrieved December 18, 2008. Cox, P.A. 1993. The Cultivation of Rhododendrons. London: B. T. Batsford. ISBN 0713456302. Cox, P.A., and N.E. Kenneth. 1997. The Encyclopedia of Rhododendron Species. Glendoick Publishing. ISBN 095305330X. Davidian, H.H. 1982-1985. The Rhododendron Species. In four volumes from 1982-1995. Timber Press. ISBN 0917304713. Francis, R. 2006. Tree rhododendrons Wildeel.com. Retrieved December 18, 2008. Fraser South Rhododendron Society. n.d. Excerpts from and comments on a paper published by: Loretta Goetsch, Andrew Eckert and Benjamin Hall Fraser South Rhododendron Society. Retrieved December 18, 2008. Goetsch, L.A., A.J. Eckert, and B.D. Hall. 2005. The molecular systematics of rhododendron (Ericaceae): A phylogeny based upon RPB2 gene sequences Sys. Bot. 30(3): 616-626. Retrieved December 18, 2008. Henning. 2007. Rhododendron history Henning Home Page. Retrieved December 18, 2008. Sütlüpmar, N., A. Mat, and Y. Satganoglu. 1993. Poisoning by toxic honey in Turkey Archives of Toxicology 67(2): 148-150. Retrieved December 18, 2008. This page was last modified on 10 July 2015, at 21:51.